Since its inception over a hundred years ago, the movie culture we love has been ground zero for the offbeat and unusual. Come join me as I uncover illogical trivia and probe into the weird and wonderful corners of the greatest form of entertainment and the people who create it. It’s not just bizarre…it’s Hollywood Bizarre. 1955’s biblical epic The Prodigal stars Lana Turner as a pagan high priestess luring a young man into darkness, but the real star of the movie is a towering, terrifying statue. 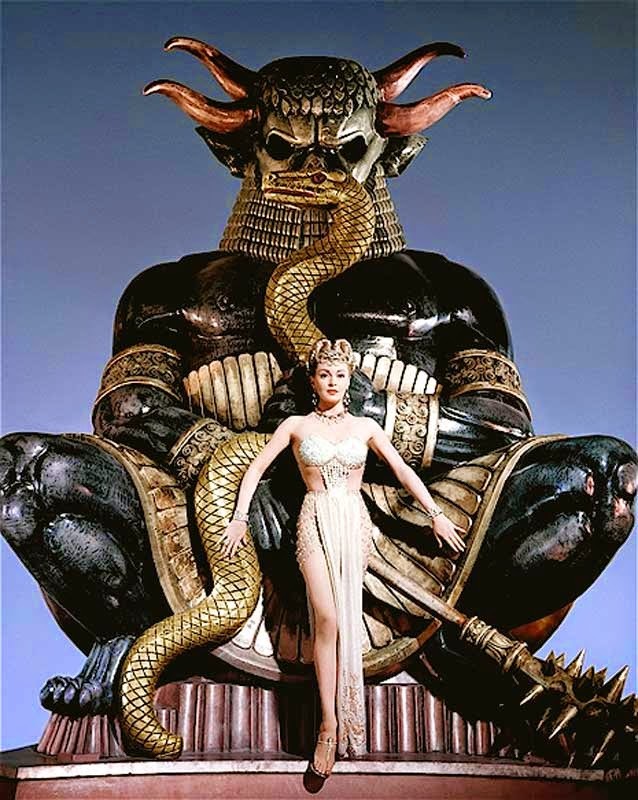 The 11-foot tall behemoth weighs three tons and is the creation of the MGM props department, and is said to depict the Babylonian goddess Astarte. It was later slightly modified, and popped up again in 1959’s Tarzan the Ape Man and finally in 1961’s Atlantis, The Lost Continent. Believe it or not, this red-glowing-eyed hulk of horror spent years in a field in New Jersey, and was recently sold to a bar in Philadelphia, who has plans to put it on top of their building. Another biblical epic, Cecil B. Demille’s 1923 version of The Ten Commandments, cost 1.5 million dollars and was filmed in the central California desert. 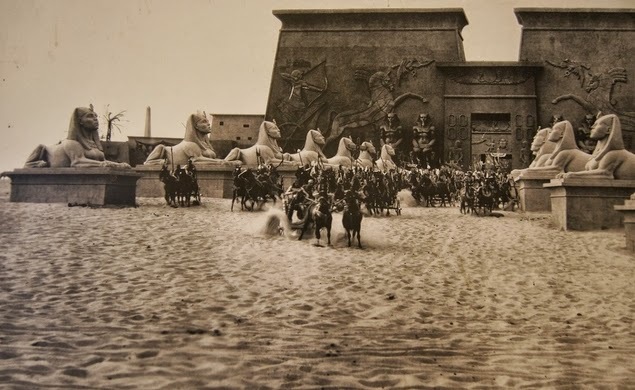 The fabricated sets included large-scale recreations of Egyptian architecture, statues, and over a dozen sphinxes. When filming ended, much of the set was abandoned where it stood and left for the elements to destroy. However, in 2014, archaeologists discovered the decayed plaster ruins beneath the California desert sands, and huge efforts were made to save as much of DeMille’s 91-year-old set as possible. The surviving remnants are currently on display at Guadalupe, California’s The Dunes Center. Los Angeles’ Circus Liquor has been guarded by a 32-foot tall scary clown since 1959. The big creeper has been seen in numerous movies, including Clueless. 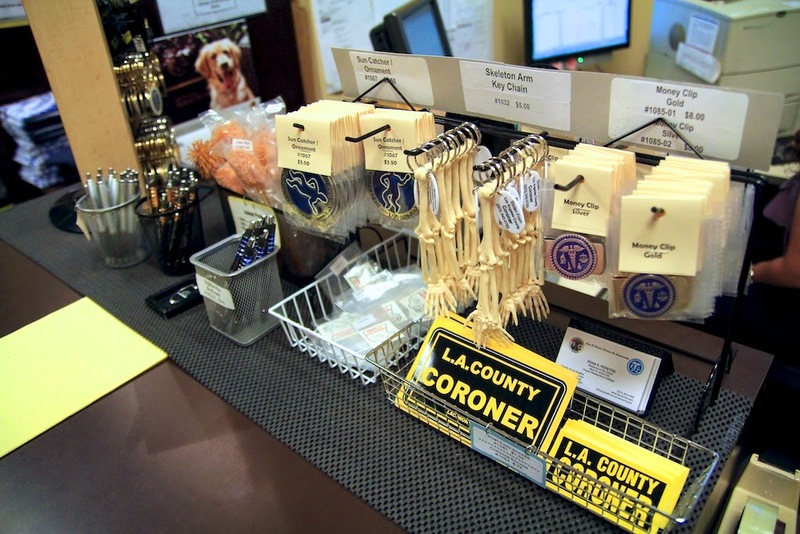 If you’re ever visiting Hollywood and are too busy identifying dead bodies down at the morgue to buy yourself a souvenir, have no fear: the Los Angeles Coroner’s Office has a gift shop where you can purchase mementos of your visit. 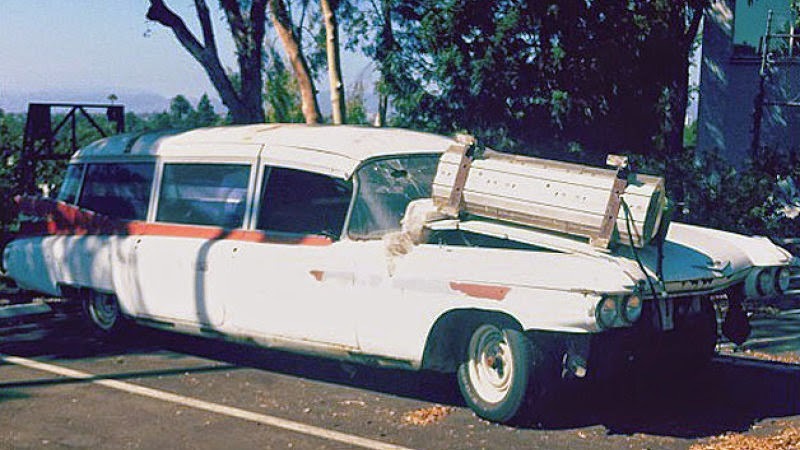 One of the most famous cars in the history of cinema is the ECTO-1, a 1959 Cadillac ambulance converted into a ghost-hunting vehicle for 1984’s Ghostbusters. Unfortunately, both the ECTO-1 and the ECTO-1A from the film’s sequel sat in disrepair on the Sony Pictures lot for over two decades, slowly decaying. Thankfully, the original car was finally lovingly restored in 2007. The ECTO-1A, however, was slated for restoration but never completed. A bunch of upset fans started a petition that collected thousands of signatures, but it seems like no progress has been made. The last photos of ECTO-1A showed a car that had been stripped and bore little resemblance to former glories. This story still has no happy ending. The most famous sound effect in the history of movies is the Wilhelm Scream. It’s been used in hundreds of films and countless television shows. The scream is attributed to Sheb Wooley, an actor who starred in dozens of cheap westerns in the 1950s, and was recorded for use in a movie called Distant Drums for a scene where a man was being attacked by an alligator. When sound editor Ben Burtt discovered the audio clip while working on the original Star Wars, he threw the scream into the movie and the rest is history. 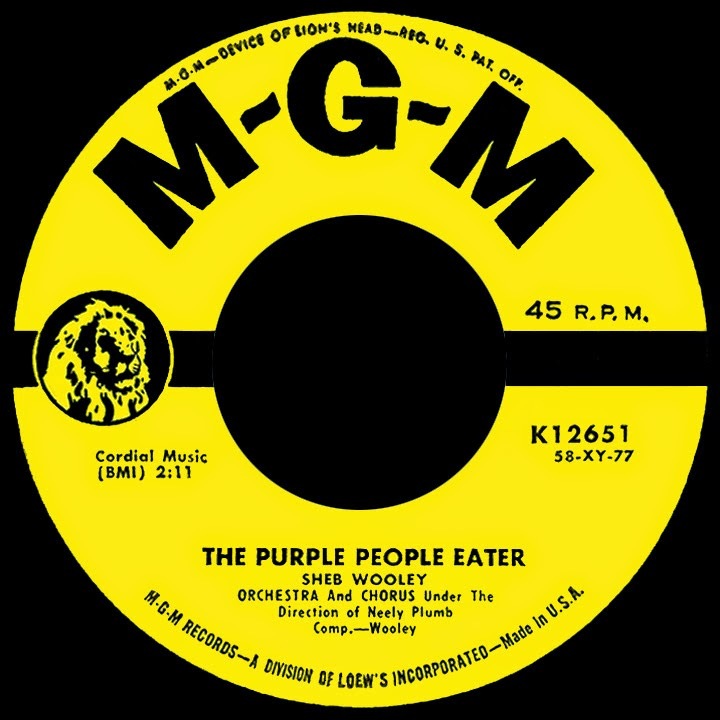 Though millions of people have heard Sheb Wooley’s scream over the years, many of them have also heard his 1958 #1 Billboard hit song, “The Purple People Eater,” never realizing both came from the same voice. 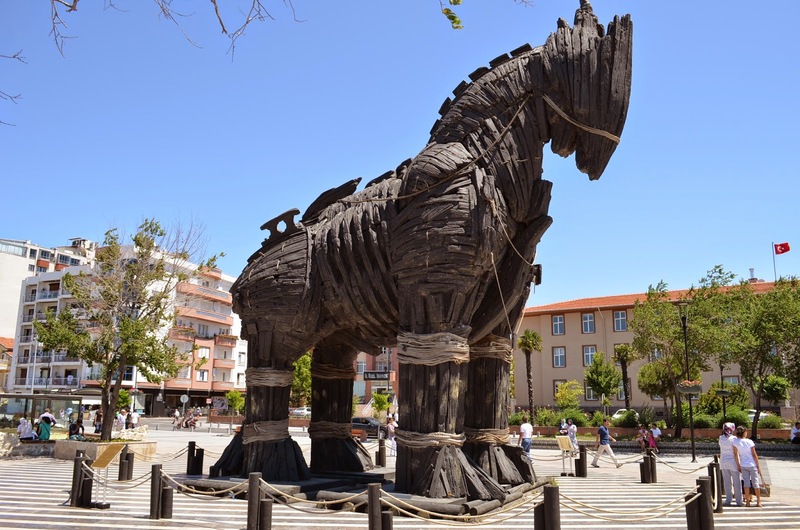 The Trojan horse created for the 2004 movie Troy currently resides in Canakkale City, Turkey. As it turns out, archeological evidence suggests that the region of Turkey known as Truva is the site of the historical city of Troy, and that a Turkish civilization dating back to 5,000 B.C. is the basis for Homer’s story, not ancient Greece. The region has since been dubbed Troia and given the title of UNESCO World Heritage Site, where a crude Trojan Horse guards the spot. After the 2004 Hollywood film wrapped production, Brad Pitt gifted the gigantic Trojan Horse used in that movie to the people of Turkey. Plans are to move the horse to Troia once they complete construction on a museum they’re building. 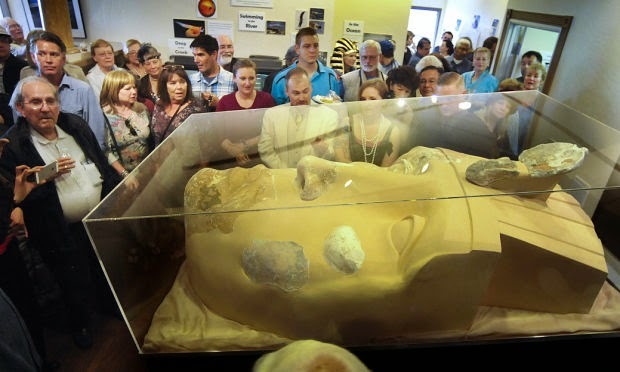 Until then, it resides in the center of Canakkale City, serving as a bizarre gift from a country thousands of miles away. How about some Hollywood sign trivia? 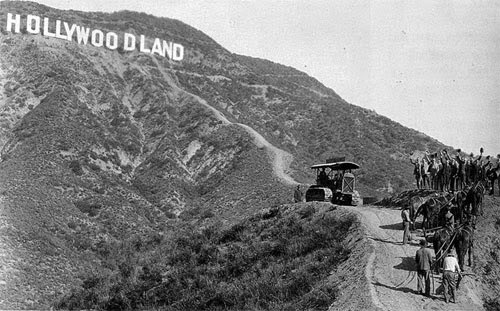 Most people know that the sign originally read HOLLYWOODLAND, and advertised a ritzy housing development. 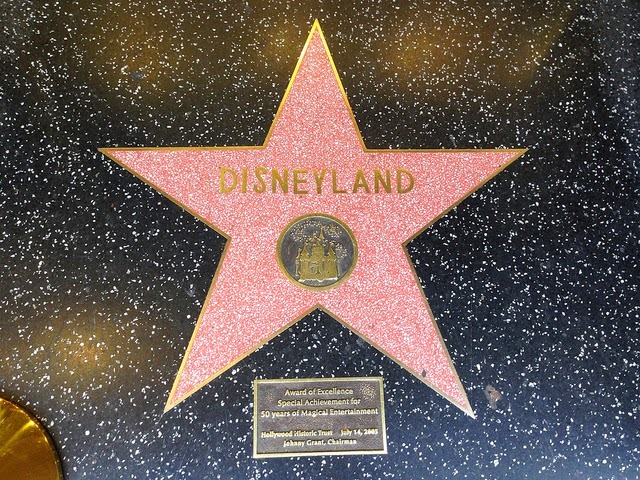 The last four letters were dropped in 1949 to stop any further association with the real estate promotion and to further establish Hollywood as its own thing. What is less known is that the sign was in pitiful condition by the late 1970s because it had only been designed to stand for 18 months. Its replacement was funded by businessmen and celebrities when a public plea was made for 250,000 dollars, with $27,777.77 required for each letter. Hugh Hefner donated for one letter, Gene Autry for another, and Alice Cooper donated in honor of the recently-deceased Groucho Marx to replace the first “O” in HOLLYWOOD. Also of interest is that there was ANOTHER famous sign in Old Hollywood. 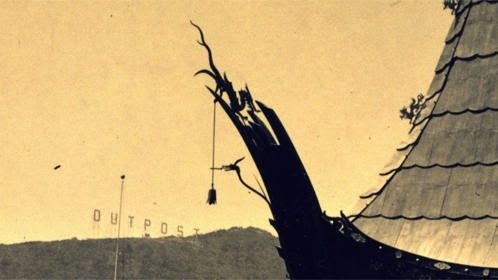 Outpost Estates was in direct competition with the Hollywoodland real estate venture, and in 1927, the word OUTPOST was installed in thirty-foot high neon letters on a hill above the Chinese Theater. Outpost Estates was another luxury housing development competing for the dollars of the Hollywood elite, and was founded on land that had a rich history. At the center of the development was a tree that had been used to hang no fewer than 13 horse thieves and outlaws. The hanging tree was chopped down in 1931 and in 1935 Bela Lugosi bought a home in the Outpost development. When the U.S. joined World War II, the neon letters of the OUTPOST sign were taken down for fear that the bright lights would serve as a target to enemy bombers. The sign has been forgotten over the years, but Outpost Estates has survived, and many of the classic homes still exist today, overlooking Hollywood and commanding millions of dollars. On a final note, if you ever feel like watching a movie with the Hollywood elite, consider joining a Cinespia Cemetery Screening. A few times a year Cinespia conducts a screenings of classic Hollywood films within the walls of the Hollywood Forever Cemetery, among the graves of hundreds of Tinsel Town’s deceased stars and creators. 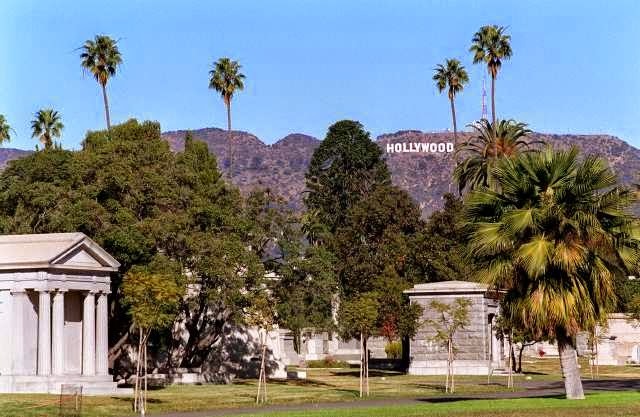 For as little as 25 dollars per movie, you can sit on the lawn of the cemetery and watch the cinematic contributions of those men and women who lay around and beneath you. It’s just one more confirmation that movies are forever, and so is the bizarre world of Hollywood. 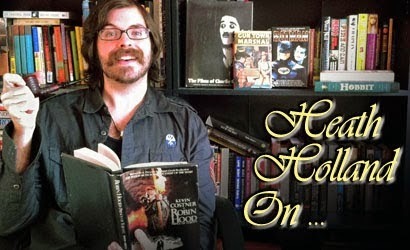 Cool article Heath,I share your love for this stuff. Cool article -- made me want to add some of this stuff to my itinerary on my next trip to LA! Or Turkey. Friends ask me did you hear the news about so and so? But its been all over the radio? I got to be honest I would love to watch Night of the Living Dead at the cemetery and bury a hand underneath the grass and at just the right moment. Well i am super evil.